Most Canadians cannot help but notice that prices at the supermarket are on the rise. Everything from apples and cheese to beef, pasta and fish is quickly getting more expensive. 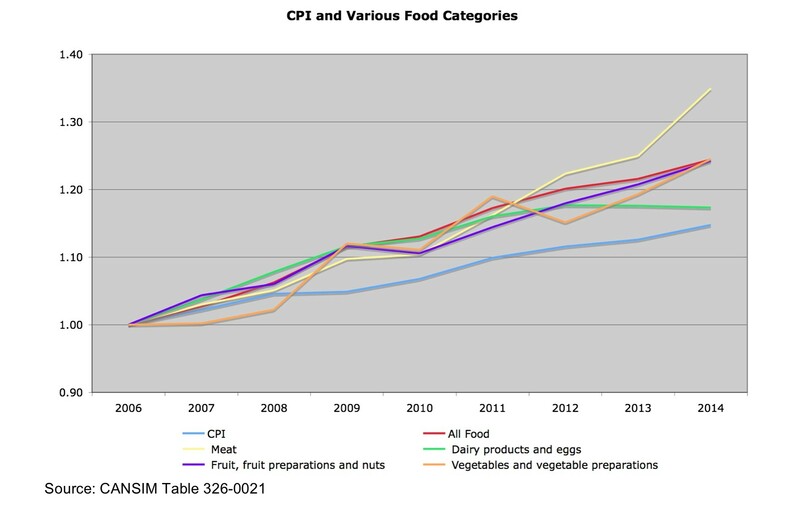 In fact, the rise of food costs in Canada has steadily outpaced inflation since 2007 and the trend is expected to continue. Between 2006 and 2014, economy wide prices rose about 14.5%. Yet, the price of food was up nearly 24%, including jumps of 34% in the price of meat and 24% in the price of vegetables. Many are wondering how high food prices will go. According to Sylvain Charlebois at the University of Guelph’s Food Institute, ‘higher food prices are here to stay.’ Canadians have long enjoyed relatively cheap food. In reality, the prices we have become accustomed to paying do not properly reflect the costs of production. However, even though the price of food will continue to grow, the rate of that growth is slowing. Baring any large supply shocks, the two major factors that will drive food prices over the next year are the declining value of the Loonie and the price of oil. How Did Food Get This Expensive? Food prices are often impacted by supply side disturbances. For example, drought in Florida means we all pay more for orange juice. Supply shocks have drastically pushed food prices up over the past five years. The recent spike in the price of meat is largely the result of PED (Porcine Epidemic Diarrhea), which killed large numbers of pigs in North America and drove the price of bacon up by 25%. Meat suppliers are also still recovering from Texas’ 2012 drought, which severely limited supplies of beef. Fortunately, these issues are sorting themselves out. With grain prices at reasonable levels, the cost of meat will likely start to stabilize. Vegetable, fruit and nut supplies have been reduced by four years of drought in California. Over the year ending in February 2015, Canadians experienced an unprecedented 40% rise in the price of lettuce. This was due to the fact that lettuce cannot be grown in drought conditions and California farmers switched to other crops. Like much of our produce, nearly 70% of the lettuce we consume comes from California. Canadians are extremely reliant on imported food from warmer countries and countries with cheaper supplies of labor. We are expected to import over $40b of food in 2015. With the Loonie tumbling and not expected to reverse its course, all that imported food is just getting more expensive. Some economists expect the Canadian dollar to bottom out at around $.75 U.S.. In February, in light of the Loonie’s sudden fall in value, the Food Institute at the University of Guelph revised its forecast for food prices for the year. Vegetables had been expected to rise between 3% and 5% in 2015, this was revised up to between 5.5% and 7.5%. Similarly fruits and nuts had been expected to see prices grow between 1% and 3% and prices are now expected to grow between 3% and 5%. The upside of this is that Canadians will be encouraged to grow their own produce and buy more local food. Cheap oil may slow the growth of food prices in Canada but it is also contributing to our low currency, which has the opposite effect on food prices. Being such a large country, distribution is expensive and this is reflected in the price of food here. In cold, remote places like Nunavut a carton of orange juice sells for about $12. Areas like this might find some relief from cheap oil. Canadians have long enjoyed relatively cheap food. Prices have not really reflected the cost of production. 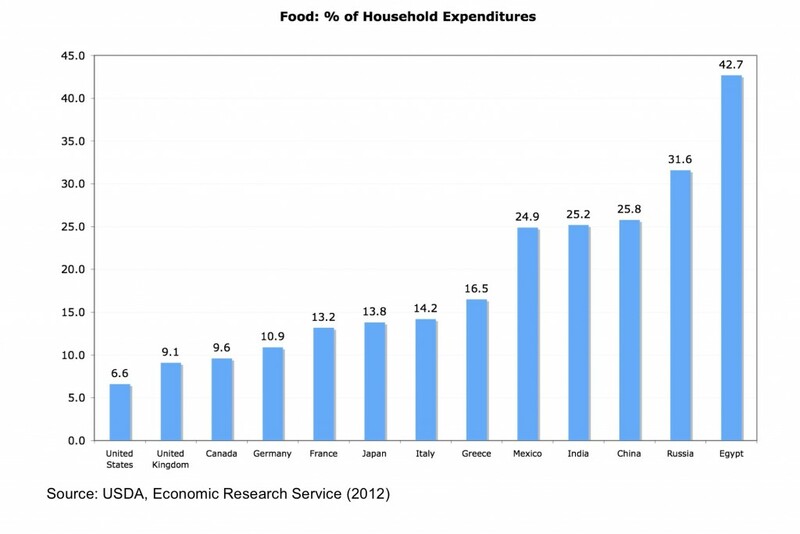 As a percentage of income, Canadians spend only 9.1% on food. Europeans, who are more connected to traditional food systems and smallholder agriculture, accept using more of their resources for food. Food costs more there. The French and Italians spend about 14% of their income on food. Americans, in contrast, have highly industrialized food systems that are heavily subsidized by the government. Less than 7% of their income is used for food. They are the world leaders in agro-industrialization; this is not necessarily a good thing. A significant amount of cheap processed American food is shipped north to Canada, keeping prices here low. Canadians are beginning to care more about what we eat and where our food comes from. We are starting to expect more from our food suppliers. The emerging demand for better quality food will drive food prices up. We may have to learn to accept that healthy food is worth the cost. All things considered, it might be time to start planting vegetables in the backyard and to even consider raising some chickens. Global food systems and large scale monoculture leave us vulnerable to supply shocks and currency fluctuations. We cannot deny the benefits of imported food for Canadians – much of what we enjoy cannot be produced at home. 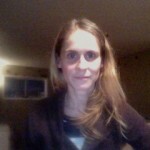 However, focusing on the production of local food will certainly help to protect us from drastic hikes in food prices.